Scable Direct 3pack - What's in the box 2x Aasama 2. 1a wall charger any other questions, please feel free to contact us. Compatibility: work with apple, Samsung, HTC, Blackberry or other USB devices. Package included: Three pack 2. 1a wall charger. Portable usb wall charger is ideal for worldwide travel, it is lightweight with 1. 17oz and package comes with 2 pack, excellent for backup. Portable design: Small and lightweight design is easy to carry, perfect for traveling. Specification -Sizes: 1. 69 x 1. 37 x 09 inches -Weight: 1. 17oz -input: ac 100-240v 50/60hz -output: DC 5V 2. 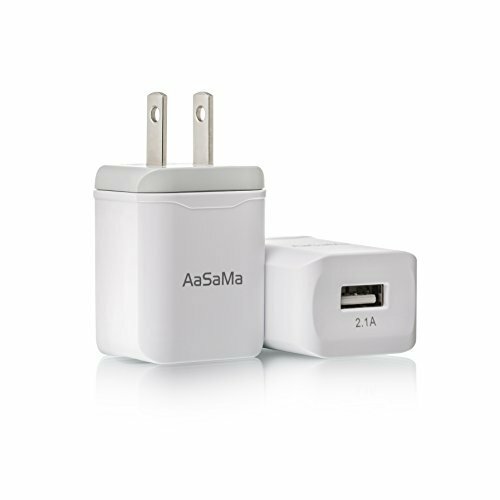 1a multiple safety certified safe wall charger with AC 100-240V, high-grade material and strict test, Aasama wall charger ensures the safety of the both charger or your devices. Aasama TM Universal 2.1A USB Wall Charger Adapter for iPhone iPad Smartphones and More 3 Pack - . Pocket-size design The lightweight 1. 17oz pocket-size wall charger is ideal for home or international travel, makes easy to carry. Efficiently charge: the 2. 1a provides a sate and fast charge to all USB devices. Certified safe: ac 100-240V input ensures superior performance and reliability. Scable Direct bc-61-cable - What you get is 3 pack 6 feet lightning cables. Sync & charge great performance with pure popper wire and standard 8 pin connector provides charging or syncing with your devices. What's in the box 3x 6 feet nylon braided Lightning USB Cables Notice: Please make sure the power output is not over 5V/2. 4a when charge with this charging cord. Constructed from heat-resistant connectors ensure complete safety and reliability. Ipad pro, ipad mini, ipad mini 2, ipad air, iPad mini 3, iPad mini 4, iPad Air 2, iPad 4. Compatibility - complete charge and sync compatibility with iphone 7, iPhone 6, iPhone 6 plus, iPhone 5s, iPhone 5c, iPhone 7 plus, iPhone 6s plus, iPhone 6s, iPhone 5, iPhone SE. Aasama 6 Feet Certified Nylon Braided 8 Pin Lightning to USB Cable 3 Pack - Compatible with the latest iOS10 without any error messages. Never worry about sudden power off or short length. Package comes with three USB cables as a great backup, you can bring them where you need. Lightweight and flexible to be coiled for portable carrying but tangle-free indeed. Incredibly durable the cable covered by high quality nylon braided material which is more durable than other plastic cable, prevent to bending or scratching. Strong construction: Made from premium aluminum alloy shell to strength the metal end. Whether you are at home, at the office or back seat of car, you can enjoy complete freedom of movement. BYZ 7.13804E+11 - Safety guarantee complete safety and reliability. High quality: sturdy and durable material, which is tangle-resistant and reinforced stress points with super long bend lifespan. Ultra-durable: covered by nylon braided jacket to prevent bending or daily wear. High-quality copper wire maximizes signal quality and increases durability. High quality copper wire ensures fast charging and data sync. Universal compatible apple families: iphone 7/ 7 plus, iphone 5/ 5c/ 5s/ se, ipod Nano 7, iPod touch 5, iPad air/ air 2, iPad mini4/3/2, ipad4/ pro, iPhone 6/ 6 plus/6s/6s plus, mini retina. Not compatible with iphone 4, iPod Nano 6, ipad2, iPad 3, iPod touch 4. White - 3 Piece - BYZ iPhone Charger Charging Cable, Lightening Cable, 6' iPhone Cable USB Sync and Charging Cord for iPhone 7 Plus 7 6S Plus 6 Plus/SE/5S/5C/5, iPad 2 3 4 Mini, iPad Pro Air, iPod - Perfect connection with your device, seamless with no static electricity. Excellent compatibility: compatible with iphone 6 / 6 plus / 6s / air 2, / 5s, iPad air / 5c, iPhone 5 / 6s plus, etc. Flexible 6 feet: extra 6 feet long is ideal to charge with a long distance. Fast charging: covered with braided-nylon jacket and four-core copper wires which is more durable and sturdier than the normal lightning cables. Strong construction: Made from premium aluminum alloy shell to strength the metal end. What you get is 3 pack 6 feet lightning cables. Perfect length: 6ft is perfect for the long-distance use whether at home, in the office. AmazonBasics L6LMF020-CS-R - Perfect length: 6ft is perfect for the long-distance use whether at home, in the office. An amazon Brand. Fast charging: covered with braided-nylon jacket and four-core copper wires which is more durable and sturdier than the normal lightning cables. What you get is 3 pack 6 feet lightning cables. An additional layer of protection has been added to the Lightning and USB ends to improve durability and reduce fraying; Cables have been tested to bend 95-degrees 4, 000 times. Excellent compatibility: compatible with iphone 6 / 6s / 5s, iPhone 5 / 6s plus, iPad air / air 2, / 6 plus / 5c, etc. Apple mfi certified charging and syncing cable for your Apple devices. Flexible 6 feet: extra 6 feet long is ideal to charge with a long distance. Apple mfi certification ensures complete charge and sync compatibility with iphone x / 5 / ipad pro / 6 / 8 / 8 plus / 7 plus / mini 2 / iPod Touch 5th gen / 7 / 5c / 6s Plus / 6 Plus / 6s / iPad 4th gen / 5s / iPad mini / Air 2 / iPad Air / mini 4 / iPod nano 7th gen and Beats Pill+. AmazonBasics Lightning to USB A Cable - MFi Certified iPhone Charger - White, 6-Foot - Connects to your iphone, ipad, or iPod with Lightning Connector and charges/syncs by connecting the USB connector into your wall charger or computer. Compact lightning Connector head works with nearly all cases. High-quality copper wire maximizes signal quality and increases durability. High quality: sturdy and durable material, which is tangle-resistant and reinforced stress points with super long bend lifespan. Ultra-durable: covered by nylon braided jacket to prevent bending or daily wear. AmazonBasics PBH-18400 - Apple mfi certification ensures complete charge and sync compatibility with iphone x / 6 / ipad pro / ipad air / mini 2 / 7 plus / 5s / iPad mini / 6s Plus / 6 Plus / mini 4 / 5 / 8 plus / 7 / 8 / Air 2 / 6s / 5c / iPad 4th gen / iPod Touch 5th gen / iPod nano 7th gen and Beats Pill+. Connects to your iphone, ipad, or iPod with Lightning Connector and charges/syncs by connecting the USB connector into your wall charger or computer. An additional layer of protection has been added to the Lightning and USB ends to improve durability and reduce fraying; Cables have been tested to bend 95-degrees 4, 000 times. Strong construction: Made from premium aluminum alloy shell to strength the metal end. Apple mfi certified charging and syncing cable for your Apple devices. White, 6-Foot, 2-Pack - AmazonBasics Lightning to USB A Cable - MFi Certified iPhone Charger - Perfect length: 6ft is perfect for the long-distance use whether at home, in the office. Fast charging: covered with braided-nylon jacket and four-core copper wires which is more durable and sturdier than the normal lightning cables. Ultra-durable: covered by nylon braided jacket to prevent bending or daily wear. Compact lightning Connector head works with nearly all cases. Apple mfi certification ensures complete charge and sync compatibility with iphone x / 7 / mini 2 / air 2 / 8 / 6s / ipad 4th gen / 5c / 5s / 6 / ipad pro / 8 Plus / 6 plus / iPod Touch 5th gen / 5 / 7 plus / mini 4 / 6s Plus / iPad mini / iPad Air / iPod nano 7th gen and Beats Pill+. Antopos 4328299713 - Safely charge your device with faster speed while connected to computers USB port or a USB car / wall charger. 4 pack of 6 feet lengths are great replacement for you, car, it is suitable for the office, room and long distance charging needs. Compatible with ipad 1 / 3, iphone 4 / 3gs, ipod nano 5th / 4S, iPhone 3G / 2 / 6th Older version. What you get is 4 pack 6 feet / 2 Meters USB Charging Cord. What you get is 3 pack 6 feet lightning cables. High-quality copper wire maximizes signal quality and increases durability. Perfect length: 6ft is perfect for the long-distance use whether at home, in the office. Excellent compatibility: compatible with iphone 6 / 6 plus / 5c, iPad air / air 2, iPhone 5 / 6s / 5s, / 6s plus, etc. Antopos 4 Pack Certified 30 Pin to USB Sync and Charging Cable for iPhone 4/4s, iPhone 3G/3GS, iPad 1/2/3, iPod Touch 1/2/3/4 6 Feet / 2 Meters - Apple mfi certified charging and syncing cable for your Apple devices. An additional layer of protection has been added to the Lightning and USB ends to improve durability and reduce fraying; Cables have been tested to bend 95-degrees 4, 000 times. An additional layer of protection has been added to the Lightning and USB ends to improve durability and reduce fraying; Cables have been tested to bend 95-degrees 4, 000 times. High quality: sturdy and durable material, which is tangle-resistant and reinforced stress points with super long bend lifespan. Flexible 6 feet: extra 6 feet long is ideal to charge with a long distance. Apple mfi certification ensures complete charge and sync compatibility with iphone x / 5 / 7 plus / ipod touch 5th gen / 6 / 5c / 5s / iPad 4th gen / iPad Air / 7 / iPad Pro / 6 Plus / 8 plus / 8 / mini 4 / Air 2 / mini 2 / iPad mini / 6s / 6s Plus / iPod nano 7th gen and Beats Pill+.